Cracking on with the Christmas cards now (yes I know there are people who did theirs in July or something crazy but for me before Xmas Eve is a major improvement!). I made this card using the sketch from Friday Sketchers. This one's for my Mum and Dad. I seem to be liking this mauve and white colour scheme this year for some reason - it is nice and calming I think. The card is inspired by the work my friend - the amazingly talented Isabelle Norris - did in the Jan issue of Craft Stamper. 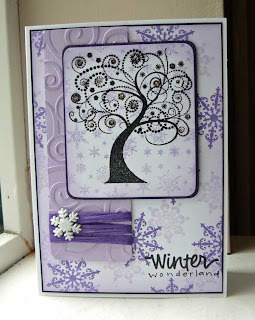 I've used the same stamp set she did, by Katzelkraft, for this card. The background panel is stamped with two colours of Memento ink, the strip at the side is Cuttlebug-ged and wrapped with raffia. I've also stamped a Crafty Individuals background under the tree. A gorgeous card and beautiful colour combo.